The typical sign is invisible. Readers usually experience the message, not the media. That’s actually preferred for a lot of signtypes, as we don’t want the reader critiquing the aesthetics, shape or colour of a STOP sign. We just want them to “get the message” and STOP. Buyers of signage often get the delivery of the message mixed up, resulting in ineffective signage. In the example of a small business sign, the most important word in, “Joe’s Garage” is “Garage” (sorry, Joe). This book is an easy-to-read, practical guide for most types of signage. It offers advice for Sign Buyers whether you are purchasing signage for your private business, or ongoing as a professional media buyer. Signage can be expensive in more ways that the sticker price. But getting it right can drive traffic to your doorstep as a perpetual advertising campaign. 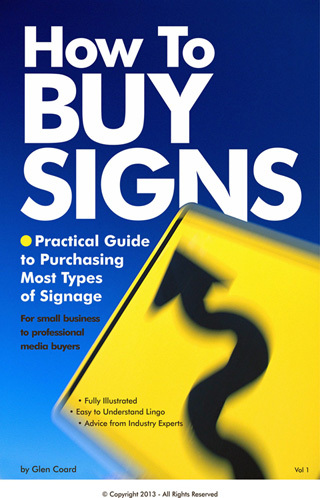 This ebook, “How to Buy Signs” will offer an insight into the signage industry, a visit to the signshop floor, explanations of common materials, and the tools to “talk tech” with your sign supplier. "